I know, I know: beating a dead horse right? Who hasn’t talked about the ending of Mass Effect 3? Few video game stories last year were as widely discussed. From the overwhelming negativity at the initial ending(s) to the lessened reaction to the Extended Cut to the few people out there who were satisfied all along, everyone who played the Mass Effect trilogy has something to say about that ending. But, like most well-thought out reactions out there on the internet, it was instantaneous. Everyone had something to say THEN. What about now? It’s been a year and the game has changed in that time. Bioware added four single-player DLC (downloadable content) packs, three of which were targeted at changing the experience of the ending: Extended Cut, Leviathan and Citadel (not to forget From Ashes, which was available day one). So playing the game today, with this content installed, yields a vastly different experience than we received back on March 6, 2012. Having recently replayed Mass Effect 3 with all of this content, I have formed a new opinion on the ending(s) and surprise, surprise: I like it. For those of you who don’t know, Mass Effect 3 concludes the story of Commander (insert first name here) Shepard. In the game, Shepard unites the various species of the universe against the apocalyptic force of the Reapers, a race of mammoth sentient machines bent on exterminating all advanced civilizations. Pretty damn epic, in other words. 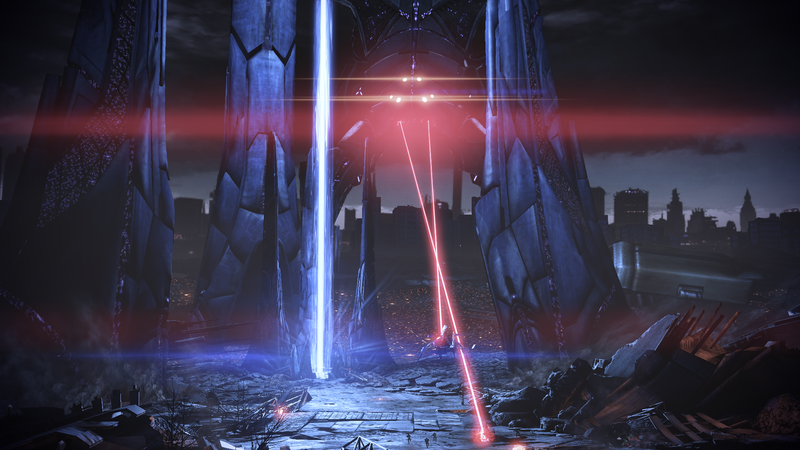 The Reapers are a great threat, with their larger-than-life presence they seem almost invincible… almost. The game ends with the final battle, Shepard confronts the main antagonist of the story (the Reaper AI manifested in the form of a child) and either destroys the Reapers, controls them or merges all organic and technological life into a new infused state of “technorganic” being. People (myself included) had problems with this. So let’s start with one of the largest factors in the ending: the main antagonist. Christened “godchild” by angry fans, this creation felt like a walking deus ex machina (plot device existing solely to nicely tie up the story). Really it was a valid criticism. At the time there had been no other mention of this being at any other point in the trilogy (aside from an absurdly minor mention in Mass Effect – like Codex level obscure). 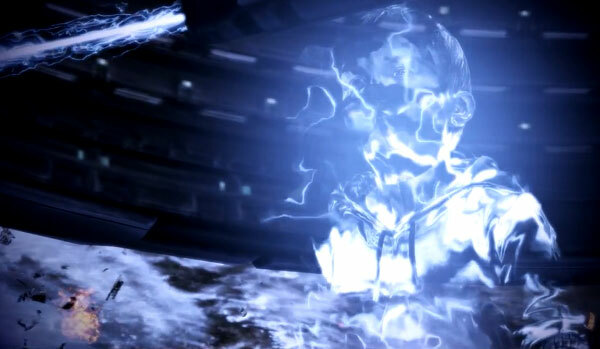 In addition, Mass Effect 2 and 3 had been, up until that point, establishing a Reaper known as Harbinger as the main antagonist (the Illusive Man, despite being Martin Sheen, doesn’t count). Harbinger appeared to be the largest Reaper, head of their fleet and, possessed a major grudge against Commander Shepard. In other words: pretty good villain material. Despite a strong, physical presence at the game’s climax, Harbinger feels very absent from Mass Effect 3. They were recycled into the first Reapers… done against their will by their own creation. This greatly enhances the thematic value of the ending. Throughout the trilogy, the struggle between AI and organic life has been a central issue. There are multiple cases: the geth vs. the quarians and the creation of the character, EDI, being the two prime examples. 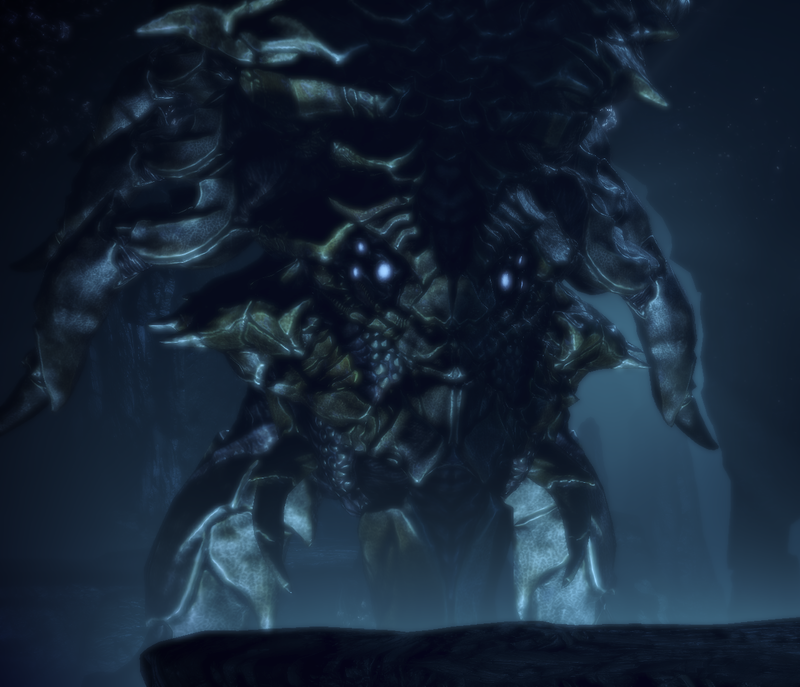 The Leviathan DLC transformed an abrupt appearance into the conclusion of a theme, with the player’s Shepard being able to pick the resolution. In addition to this sequence, new dialogue options were added with the Catalyst by both the Extended Cut and Leviathan dlcs to allow for a fuller, more believable conversation. With the “godchild” problem at least addressed (you can still find Bioware’s antagonist decision to be a poor choice but at least now it makes sense), a large section of the ending is improved. Another major issue was the lack of variety in the ending. I can remember reading, before Mass Effect 3 came out, that there were 16 different endings in the game. I was very excited – until I saw the original ending. Basically there are three variants: Shepard causes a massive explosion in every ending, it can be red, blue or green. Everything else (with the exception of very small details) plays out exactly the same. Doesn’t sound like 16 different endings to me. Thankfully, all of that was addressed in the Extended Cut DLC. Are the endings still similar: yes. Are they now different enough to be enjoyed and have the player choices felt: yep. So that’s two problems down. One of the main goals of the Citadel DLC is to throw a fun party for your crew. I’m not kidding. Bioware showed incredible care and intelligence in the release of this DLC. Of all the endings in Mass Effect 3 (the entire game is itself just one giant ending), this one feels the best. Players now have the ability to relax and have fun with their Normandy crew before it’s time to say good-bye at the end. The Citadel DLC is not driven by plot but by characters and that shows an essential of storytelling: the best stories don’t rely on their plots alone to be interesting. Is the ending of Mass Effect 3 perfect: not by a long shot. Yet it is now satisfying enough that I didn’t feel cheated or let down in the final minutes. While Mass Effect 3 is overall the weakest game in the series, the blame for any storytelling shortcomings should not fall solely upon its shoulders. Indeed, despite being the overall best game in the series: Mass Effect 2 is the entry where the story seriously miss-stepped (the fact that a player can skip Mass Effect 2 entirely without missing any significant plot development is not a good sign). So if you were a fan of the trilogy but didn’t like the ending fist time through, do yourself a favor – get the DLC and experience it again. Except for Omega, I’m not kidding, stay far away from that waste of downloadable content. So two problems were fixed. However, there were other problems. One of the biggest is that it drags back a resolved conflict. The conflict between organics and synthetics was resolved, thematically, on Rannoch. That was the whole point of the Rannoch arc. Either you let the geth live, winning them over to your side, and proved that organics and synthetics can get along; or you wiped them out, proving they can’t get along. If you made peace between the geth and the quarians (as I imagine most of the people who played the full trilogy did), then you’ve proven that we’re not so different, that we can get along, we can live in peace, all that stuff. And then we reach the Space Brat and he’s all, “LOLNOPE!” We don’t even get to bring up the geth. Hell, we don’t even get to say that we believe peace is possible. He says organics and synthetics will always try to kill each other, and we’re forced to just accept it. We can’t say, “No, I don’t think it’s inevitable. I think we can get along. The geth and quarians have achieved peace. One of my friends is dating an AI, who’s done more to help against the Reapers than she could ever be repaid. War does not need to be the only option. Peace is possible.” All we’re allowed to say is “hurr choice/freedom durr.” Which has nothing to do with his reasons for the cycle. It’s an (incredibly weak, failing to convince even me) emotional appeal, made to a being of logic. The conflict shouldn’t have been about organics vs. synthetics. It should’ve been about organics vs. organics, which I would argue was a much more important theme of the series. The rachni tried to kill everything, until they were wiped out by the krogan, who tried to kill everything before they were nearly wiped out by the turians. Shepard can even ask Avina, in the first game, who stops the turians. The second game has us fighting the Collectors, who are still organics. We learn the Reapers are a mix of organic and synthetic. And then in the third game we meet Javik, and learn that the Protheans were a violent, conquest-driven race. That their cycle was full of constant wars, same as the present cycle. And had the Protheans not been wiped out, humanity would’ve been made a slave race. And humanity wouldn’t have stood a chance against them. And the Protheans wouldn’t have stood a chance against their predecessors. Go back a few million or billion years, and if the Reapers hadn’t destroyed those early races, would humanity even exist? Or would we have been killed before we even got a chance to live by some race colonizing Earth and screwing with the natural order of things over time? That’s a much more complex and interesting conflict. Can Shepard deny the races of the future the chance to make their own way in the galaxy? Also, Synthesis is still one of the dumbest things I’ve ever seen.